Waking up in pain every morning is something I’m just about getting used to. It’s becoming a new way of life. The first thing the cast ask each other every morning is “how badly are you hurting today?” which makes us all laugh. We’re slowly becoming a little family and supporting each other whenever someone needs it. Liam Steel, (Co-Director) has us doing a variety of killer exercises every day, his particular favourite… THE PLANK! The cries of encouragement echo through the building as, trembling and crying out, we each fight to make that final push up, that last sit up, and complete another gruelling training circuit. But it hasn’t been without its rewards; I already feel fitter and stronger every day. Drenched in my own sweat, I routinely do a vocal warm up with the cast, before continuing the work on the play itself with Timothy Sheader (Director) and Liam. It’s surprisingly challenging to behave like an excited little kid again. Finding that physicality and mind-set as an adult requires you to let go of all your inhibitions and ignore that voice in your head that tells you to behave and be mature. But it’s fun! Being allowed to climb around the set, and act like a kid is very liberating and good for the inner child. Using the set as a massive jungle gym is helping to bring out the youth in my character. We reached a point in the script that requires myself and other characters in the scene to build shelters on the beach, and instead of simply choreographing something, the directors took the genius approach of making us actually do it. We spent an hour or so making shelters out of the props and objects in the room. It’s clever because it adds an even deeper sense of naturalism to the piece. It was like building dens and forts as kids. I couldn’t stop thinking how wicked my job is! To be honest, the shelters we built were pretty bad, but having that much fun doing it is a huge bonus to working on a play like this. My first experience of stage combat was incredible! Kate Waters, (Fight Director) is one of the best in the business; her scrappy, life-like approach to fight choreography adds a whole new dynamic to the piece. 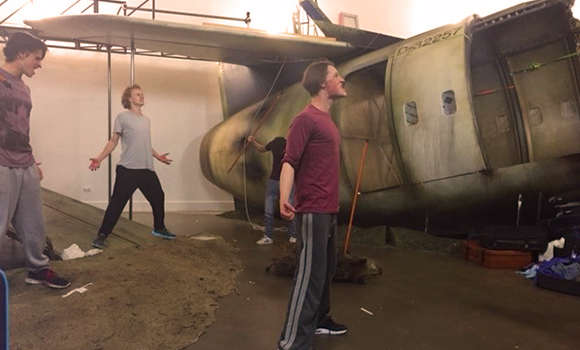 After some training the cast felt confident to “go for it”, and looking around the rehearsal space, it did look really realistic. I have a great fight with Jack, (Freddie Watkins) that I can’t wait to start choreographing. I was also impressed by the agility and athleticism of Keenan Munn-Francis (Simon); he was involved in a fight sequence that required him to be pushed and thrown around by the cast, before being lifted up and thrown through the air. Pretty glad I didn’t have to be flung around like that, but it’s a real testament to the trust we all have in each other. You always know that someone is going to be there support you. To end my first week of rehearsals we reached a stage in the script where there is a real emotional conflict between everyone in the cast, but at the forefront of this are Ralph, Jack and Piggy. There was a moment were I felt that everyone was connected and responding completely truthfully to each other. Towards the end of the scene I looked from Piggy, (Anthony Roberts), to Jack, and then to the entire cast and had goose bumps. It was the perfect end to my first week of rehearsals, and completely convinced me that this show is going to be something very special. I turned 22 on the 7 August, and when the guys sang happy birthday to me, I was again reminded how incredibly lucky I am to be working with these people. I saved opening the cakes until our lunch break on Friday. What a way to spend a birthday! Luke, I am just now discovering you in Beautiful People here in Los Angeles eight years after the fact! Perfect timing since it seems you are back in a big way. I love BP so much and can see that even back then you were heading places. Excited that adult Luke is about to take the UK by storm! This is an incredibly well written blog post. Congratulations. I hope to see more of your writing as time goes on. Thanks for posting.